Albtal-Verkehrs-Gesellschaft mbH (AVG) has placed an order for Bombardier Flexity dual-voltage tram trains to operate in Karlsruhe, Germany. The contract is worth around €60 million, and part of an option to extend from an original order for 30 dual-system tram trains made in 2009. The first 30 tram trains from the 2009 order are in operation in Karlsruhe and the surrounding area. The tram trains meet the regulations of BOStrab (German Tram Construction and Operation Regulations) and FBO (German Train Construction and Operation Regulations). The Flexity model for Karlsruhe features three sections, and are a total of 37m long and 2.65m wide. They have capacity for 244 passengers. The trams are medium-floored, ensuring that it is fit to operate on existing infrastructure, but still optimally designed to make rapid passenger flow easy, and universally accessible for passengers with limited mobility. They are also accessible for passengers pushing trams or heavy bags. The vehicles feature climate controlled interiors, with three multi-purpose areas as well as a passenger toilet. The Bombardier Flexity also has conventional air springs which limit wear-and-tear of wheels and tracks. The top speed of the trams is 100km/h. These vehicles are the same as the original order, with the exception of original features which meet new customer requirements, including new handle straps for standing passengers. The new vehicles will be made at Bombardier sites in Bautzen, Germany and Vienna, Austria. 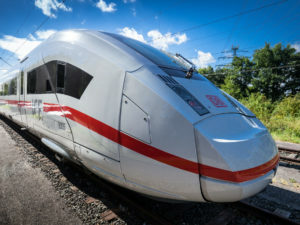 The Bombardier Mitrac propulsion and control system will be provided by Bombardier Mannheim and Bombardier Flexx Urban 2500 bogies by Bombardier Siegen, both in Germany.